So you finally got around to hanging some hooks on the wall by your front door, or maybe you even bought a coat rack, but what about your keys, your phone, your dog’s toys, and all the other various tchotchkes you carry around? That’s where Matthew Plumstead‘s delightful, and oh-so-simple-you’ll-wonder-why-you-didn’t-think-of-it-yourself Clip Tree comes in. We spotted this charming design at this year’s ICFF during New York Design Week, and not only is it practical, but it looks great! 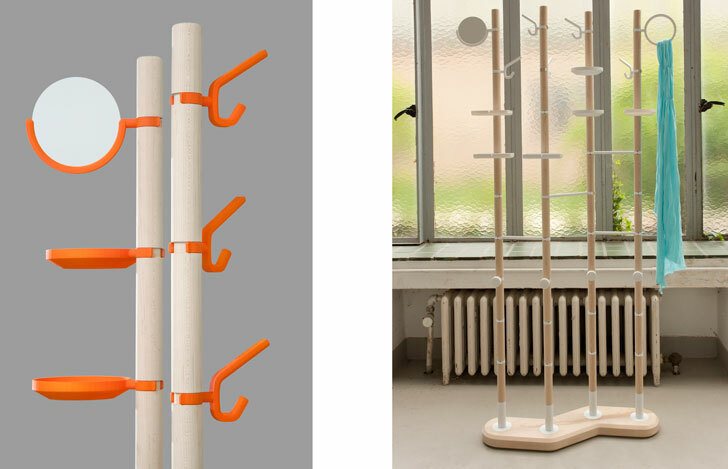 Made of maple wood, recyclable steel and natural rubber (in either orange or white), the Clip Tree is meant for use virtually anywhere–homes, offices and even hotel rooms. Rubber components, which range from simple hooks to round and square trays and even a small mirror, clip into notches that run the length of each maple pole. They hold fast but are easy to remove, so the whole rack can be adjusted to fit your needs for many years to come. We daresay, no home should be without one. Very cute rack.I like the style you can still add something what you want to display. So you finally got around to hanging some hooks on the wall by your front door, or maybe you even bought a coat rack, but what about your keys, your phone, your dog's toys, and all the other various tchotchkes you carry around? That's where Matthew Plumstead's delightful, and oh-so-simple-you'll-wonder-why-you-didn't-think-of-it-yourself Clip Tree comes in. 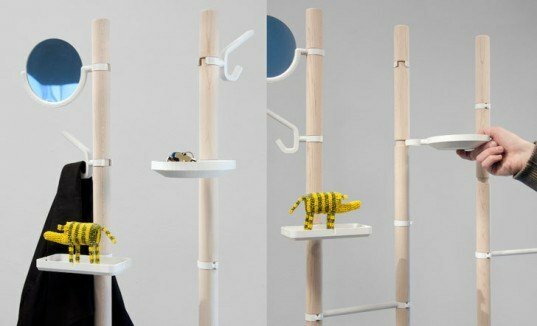 We spotted this charming design at this year's ICFF during New York Design Week, and not only is it practical, but it looks great!